New Jersey is the diner capital of the world. This is both a good thing and bad. It takes a lot for a diner to actually stand out as being one of the best. New ones are opening up all the time with average food and bloated prices. Some of the older, vintage ones have seen better days but are still worth going to for their charm. For me, diners are graded on a different quality scale. I don’t think anyone is going to one for a fine dining experience and Zagat-worthy food. Most of us just want a decent sized portion of adequacy and a price we can live with. Well, prices of everything are going up in the Garden State, including food. Some diners are now charging what you would expect from a fine-dining establishment, and cranking out some sub-par dreck. Enter the Ocean Bay Diner, conveniently located on Route 35 on the Cliffwood Beach/South Amboy border. Offering everything you could hope for, and open 24 hours, this may have just become my new late-night spot. Hazlet is a sleepy town. Except for a few chains, everything closes early. If you want to eat out after 10 PM, you are relegated to ordering pizza or Chinese food. With one of my hockey guys working late one a Wednesday night a few weeks ago, and me teaching a night class, we were both starving. It was almost 11, and we were running out of places to go. We had passed by the Ocean Bay Diner several times and remembered the sign saying they were open 24 hours. We headed on over. It isn’t much to look at from the outside. Not bad, just rather bland. Inside, however, was a different story. It was neat and clean, and had obviously undergone a recent renovation. The bar, no-doubt from a previous restaurant that had a liquor license, was turned into a charming coffee bar. The beer taps were replaced by a Cappuccino machine. Opening up the menu revealed the first thing I look for in a diner: everything. As a sandwich guy myself, I usually go with something simple, but it is nice seeing a dizzying amount of options. Prices were fantastic and the selection was good enough for anybody. He started off with a slice of chocolate cake, which I tried and thought was very good. For his meal, he had a Greek omelette and he absolutely loved it. The home-fries were well-done as he asked for. 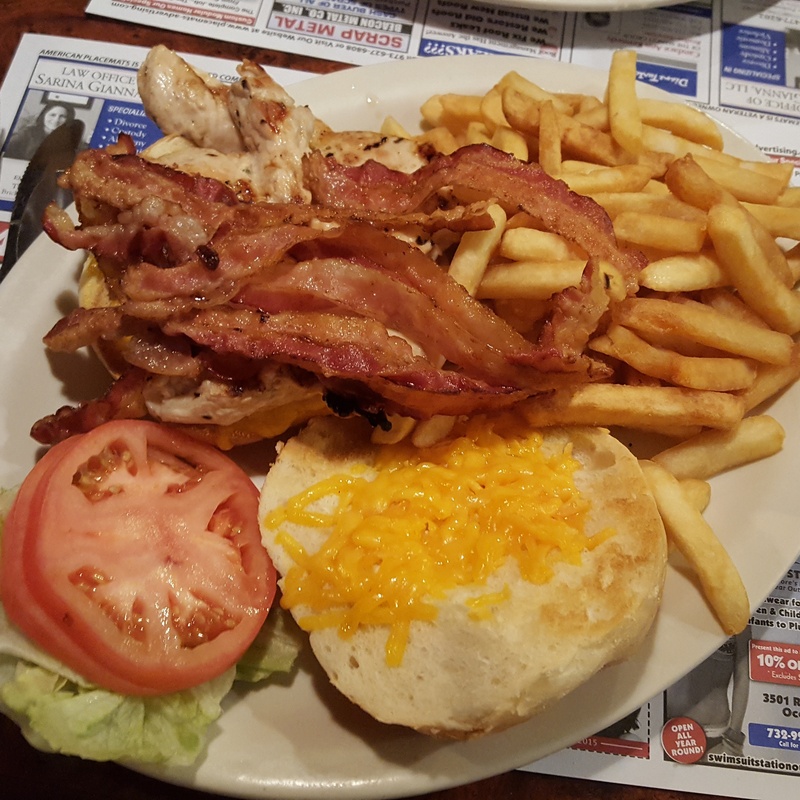 My meal was the #4 grilled chicken sandwich, which came with cheddar cheese and bacon. Please excuse me while I rave about this ordinary and unassuming sandwich. For $9.75 it came with soup (I had chicken noodle), fries, and cole-slaw. The chicken itself was so massive I had to cut part of it off. As for the bacon, they gave me five—yes, five—slices, all crisped to perfection. The side of fries was gigantic. I couldn’t even finish them. You know I have tried some interesting things over the years. I can’t believe how happy I was that this mere chicken sandwich was so great. To top it off, the breasts were lightly marinated in oregano (the arch-enemy of my taste-buds) but I still enjoyed it because it was not overpowering. I find most diners do the oregano rub on their chicken breasts. It must be the Greek thing to do. Some go overboard, but they didn’t. Other places also cook the hell out of it, but this chicken was tender and juicy. With all of our food combined, neither of us could find a damn thing wrong with it. Prices were great, portions over-sized, quality right on point. I am going to give this a 3.5 out of 5 stars. I can’t wait to come back and try something else. The waitress, who told us she always works over-nights, was very friendly and pleasant. If you’re looking for one of those midnight diner runs, make this your stop. You won’t be disappointed. This review was previously featured here. 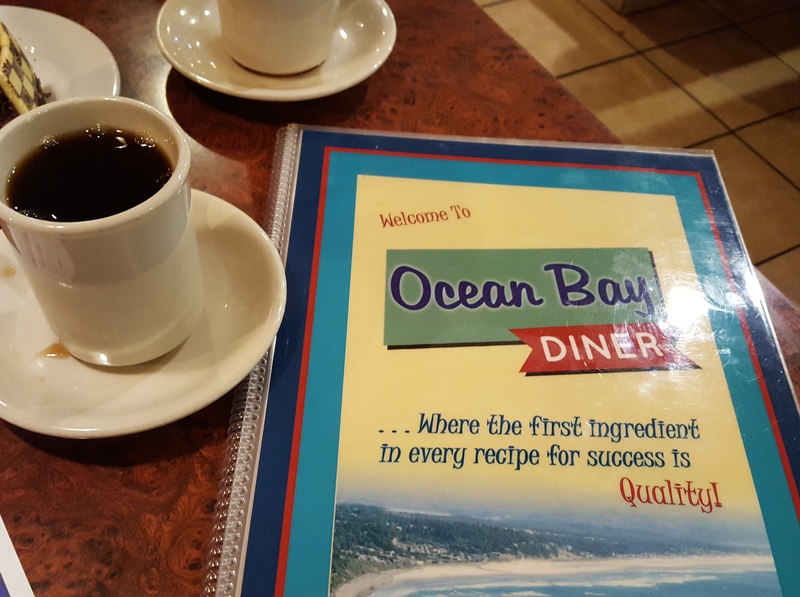 The Ocean Bay Diner is located at 1803 State Route 35, South Amboy, New Jersey.